Until you've tried them, don't say 'ewww, gross', because these are brilliant! I had some honey roasted cashews left after Christmas, and even though they are good straight out of the bag, this is a new way to enjoy them. I think I was eating some chocolate at the time and on the table was a plate of nuts left over from my son's birthday party. The rest, as they say, is history. It's probably better to use the jumbo honey cashews because they are easier to coat, and any good quality chocolate you like - I used Belgian milk chocolate. Gently melt some chocolate using your own tried and tested method. Carefully drop 3-4 cashews at a time into the melted chocolate and turn them over using a fork until they are thoroughly coated. Use the fork to lift them out of the chocolate and place onto baking sheets covered in non stick baking parchment. You don't want them touching each other so space them apart. Continue with the rest of the cashews. Just make sure that you don't pour the nuts straight from the bag into the melted chocolate, because there is a lot of the sugary 'dust' flying around in the bag. Pop them into the fridge until the chocolate has hardened - if you can wait that long! Sometimes, the simple things really are the best! I've had a good look to see if someone has already done this - there are plenty of chocolate covered cashews but not chocolate covered honey roasted cashews. So I'm submitting this to an event called Original Recipe Round-Up, a fabulous monthly event hosted by Lore, from the food blog Culinarty. gross? no chance, they sound gorgeous!! This year we've got to get you putting the baking tray aside and wrapping some chocolate and chilli sauce round some nice pink game. Nice treat :) and they re quick to make ! They sound unbelievable! No chance you'd see me passing on these! i enjoy cashews. i like 'em better salted. i like 'em even more when they're honey-roasted. dipping them in chocolate? ding ding ding--we have a new favorite! wow. i'm thinking if there was something spicy in the mix they would go perfectly here. what an excellent idea. Oh no, I didn't say "ew." I did just say "OOH!" out loud because I never thought of this combination and it looks fantastic. Thanks for posting!! You are so right! the most simple recipes are sometimes the tastiest and may I just add your chocolate swiss roll in the previous post is simply divine! Yum, I love cashews plain. Honey roasting and covering them in chocolate only makes them better! Thanks for sharing your delicious snack with the Original Recipes Round-Up! What a great way to use up leftover nuts. I think that honey and chocolate go well together so I can imagine these would be great. They might be 'brilliant', but methinks they're also highly addictive, and very, very norty...! Nic, these sound and look marvelous! Chocolate. Honey Roasted. Cashews. OMG. MMM Those sound yummy, Nic! Why would I say these were gross? They sound fantastic! OMG!! I am sooo trying these.. Wow! Lip-smacking delcious, Id bet! You should know, Chocolate is like a religion to me. But chocolate combined with cashews (or any other nut) sends me. Sweet & salt is me favourite thing so these make perfect sense to me! At Dean & Deluca in NYC I bought some pretzel poppers - basically little spheres of salted pretzel covered in dark chocolate. Heaven! Simple, special,ROCKING GOOD!! I love originalty like this Nic...oooooooh, yummily done indeed! My favorite nut and my favorite snack - chocolate. How can you go wrong?! I simply cannot say no to cashews and macadamia nuts. And now - with chocolate - I'm doomed for sure. Beth - I love that combo too! Trig - heh heh! That’s why you are the chef and I am just the humble home cook! Sounds interesting though! Valli - I’m glad I don’t have to convince you either! Snooky, LyB, Grace, Sunita, - thank you so much! We are never full - spicy is a great idea, I might try them with some chilli chocolate!!! Dragon - oh you poor thing, that is a shame. I bet you have to take so much care when eating out. Bensbaby116 - ha ha and thanks so much! Gaga - hello! I agree and am glad I’m not the only one! Lore - I’ll look forward to the round-up. Katie, aforkfulofspaghetti, jd, miri, muralimanohar, Susan, Mike, and Sam - thank you all for your lovely comments! Donna and Navita - thank you and welcome! Marysol - anything with chocolate is my friend! Jeanne - the pretzels sound delicious, lucky you to get to try them! Dragana - thank you and thanks for visiting! Giz - oh macadaia nuts, I’m going to have to coat some of them now! Holler - hope you try them, you might like them! Browniegirl - midnight snacking sounds rather tempting!! chocolate clusters with any nut makes my day. But buttery honey roasted cashews, now thats a treat! A great idea - they look good! I love cashews!! Wow - these look great. I could TOTALLY go for some. I could definetly go for a handful of those. Salt in otherwise sweet foods works suprisingly well...Great little recipe! 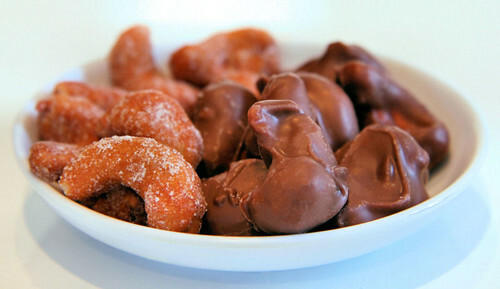 Oh, gosh -- how could anyone turn down cashews AND chocolate?? YUM. OOOOO I make honey roasted cashews. It never occurred to me to dip them in chocolate . Now of course im going to ahve to give it a whirl.